We invite you to join us at Nossa Familia Coffee's Pearl District roastery (811 NW 13th Ave) for a free and informal public tour & cupping every Tuesday at 12:00pm. The tour group will gather in our Espresso Bar, and then we’ll take you behind the scenes into our roastery. You’ll spend around an hour learning all about our coffee—especially how it is roasted and professionally evaluated, from bean to cup. After getting a peek into our roasting practices and learning a bit about the chemistry behind the process, we’ll lead you into our lab for a coffee cupping. 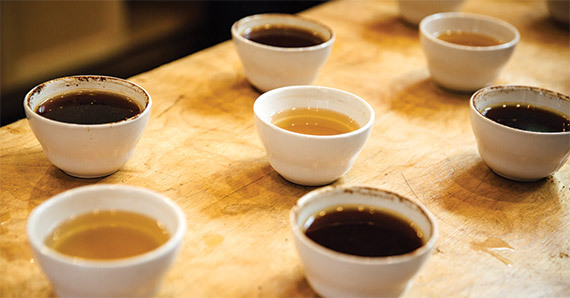 During the cupping, you’ll have the opportunity to experience a variety of coffees, tasting them and identifying flavor differences and profiles. Our public cuppings are led by Chris Ryan. For questions or special event inquires, please email: chris@nossacoffee.com.